It has been a while that have not posted anything here. I must have been busy with research for the past week. On Friday, we had a big feast where everyone cook their favorite dish. Finally, I'm gonna post my signature dish. 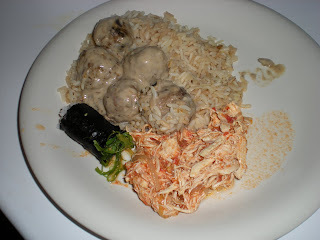 This is simply meatballs with cream sauce along with a touch of white wine. 1. Heat oil in large frying pan over medium-high heat. Add onions until lightly browned. 2. In large bowl, add beef, crumbs, onion, egg, parsley, sugar, salt and pepper. Mix well with hands. Shape into meatballs. 3. 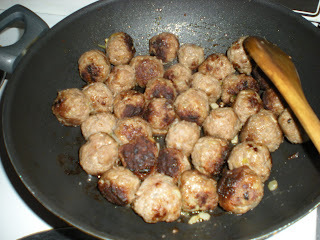 Add meatballs in medium-high heat. Cover and cook until browned on bottom then turn. About 20 minutes. Drain on paper towel and remove grease from pan. 4. Turn heat to low. 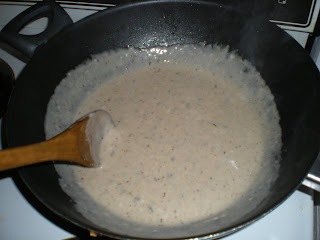 Pour cream of mushroom into pan and add enough water if needed to make it a thick gravy. Add white wine and stir. Let it simmer for a few minutes. 5. 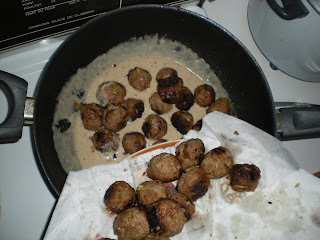 Return meatballs to skillet and stir until coated. 6. Serve it on top of rice.